There are some games on the Super Nintendo worth owning just for the awesome amount of cheesyness in them. Best of the Best are is one of them. 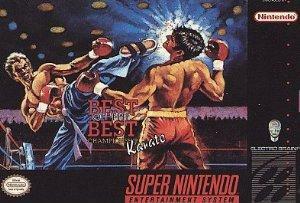 Best of the Best isn't the best fighting game on the Super Nintendo system. The controlls are bad with different moves assigned to each button on the controller. The game is really slow and very repetetive which gets old fast. The graphics and animations though are really fun to watch, especially the umpire. The sound effects are really nice too, the best one beeing when someone punches the other in the guts. Best of the Best is a really crappy game, play it for the cheesyness!